The eyes, ears, and slit-like nostrils are positioned on the top of the head so that it has full use of its senses while the body and majority of the head are submerged in water. When submerged, the heart rate slows from 90 beats per minute to 20 beats per minute. This allows the animal to remain totally submerged, without breathing, for more than 5 minutes. These animals play a vital role in the ecology of inland water by keeping the waterways free of excessive vegetation. 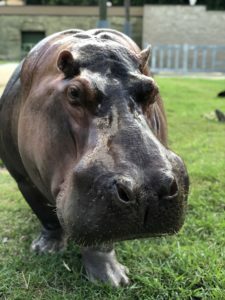 The hippo’s skin is virtually hairless and contains no sweat glands but does have, instead, a specialized gland that secretes a reddish fluid similar in appearance to blood. This fluid helps to keep the skin moist in the hot sun.